Few people in the world know more about hickory putters than Gavin Bottrell of antiquegolfclub.co.uk. Gavin is a dealer in hickory and antique clubs whose love affair with hickory golf started in 1997 when he bought a bag of old clubs. He now runs an international dealership and has a personal collection of over 4,000 clubs. 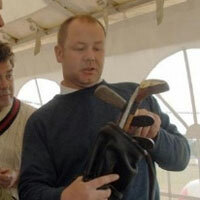 He buys and sells clubs and organises heritage golf days where anyone can try the equipment of the last 200 years. Best-Putter.com: What dictates the value of hickory putters? Gavin Bottrell: In a nutshell, there are three factors: Rarity, age and the reputation of the person who made the putter in the first place. B-P: Can you give some examples? G B: Sure. A particularly rare putter is going to appeal to collectors who are interested in owning something that very few people have. Great examples of this are some of the putters made in the 1920s. This was a time of great experimentation and little standardization in club design, so you find some weird and wonderful putters that were produced then. Some had moveable heads or two or three different striking faces. Because they were soon outlawed, very few were produced and they are therefore highly sought after. G B: Generally speaking, the older a putter is, the more valuable, assuming it's in good condition. Putters which were made before 1860 are usually very valuable. There are putters which date back to the late 1700s, and these are true collectors' items and are in several cases worth $10,000s. B-P: Wow - what are the highest prices you've ever heard of? G B: The sale of the club collection left by the late Jimmy Patino [founder of Spanish Ryder Cup venue, Valderrama] generated the two largest sales I know of. Patino had in his collection what is thought to be the rarest putter in existence - a "Royal Perth Putter" (similar to the one pictured below) - which dates from 1790, and it sold at auction in 2013 for around £35,000 ($55,000). Patino's estate also sold a wooden-headed putter made by Andrew Dickson of Leith in around 1770, and this sold for an undisclosed sum, thought to be between £60,000 and £70,000 ($95,000-$105,000). B-P: You mentioned clubmakers; which are the most sought after? G B: You're looking for shop-made putters, which were crafted by hand in the workshops of the first golf clubs in Scotland. You can tell from the "cleekmark" (the imprint made by the clubmaker giving his identity) who made the putter and this generally gives you an idea as to its value. B-P: Where are the best places to buy antique hickory putters? G B: Although most collectors start out by buying a bag of dusty old clubs in an auction house like I did, most of the highly-collectible putters you'll find today are sold in specialist sales at the big international auction houses like Sotherby's, Christie's or Bonham's. G B: Ebay does give you lots of options in the antique and hickory putter marketplace, but there is a caveat to consider ... With condition being so important in determining value, there can be risk attached to buying something you haven't physically held in your hands. That said, ebay's terms and conditions do put the buyer in a pretty good position now if an item is not as described. Got an hickory or antique putter to sell? See where your putter fits into Graham's history of the putter, and whether it's worth anything.